Are you going to leave that there (2015) Central Saint Martins. 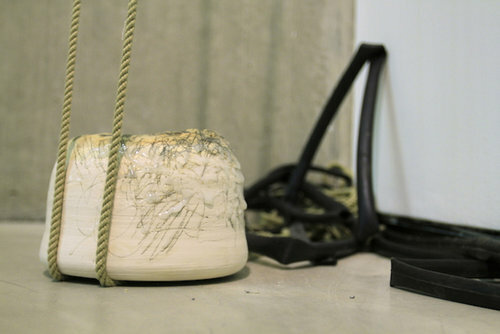 Ceramic, rope, rubber, ribbon. The work was made from the same weight of clay materials as the makers body weight, both plastic clay and casting slip. Through this personal physical gesture the scale of the work was determined. The material qualities of clay and the contrasting processes of slip casting verses thrown on the wheel act to express the artists themes within this installation of balance, tension, vulnerability. The installation was hung to enable the viewer to walk through the the work, to experience it from the inside out.